The Larsen Ice Shelf is located on the north-western side of Antarctic Peninsula, extending out towards South America. 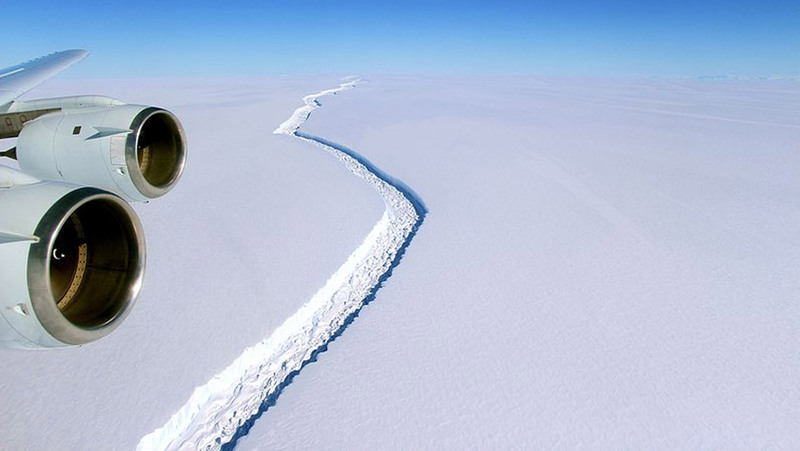 The ice shelf is made up of a number of distinct segments, which have steadily been breaking up since the 1990s. Now, one section of the ice shelf, known as Larsen C, looks set to be on the brink of collapse. The Larsen Ice Shelf has been breaking up since the disintegration of Larsen A in 1995, followed by the collapse of Larsen B in 2002. It now looks as though Larsen C is due to break off incredibly soon, which will create one of the biggest icebergs ever recorded. Larsen C covers an area of around 19,000 square miles (50,000 km2) making it the fourth largest Antarctic ice shelf. It has been closely monitored by scientists from the UK based Project MIDAS. Project MIDAS is an Antarctic research project focusing on the effects that our warming climate is having on the Larsen C Ice Shelf. Using a combination of fieldwork, satellite observation and computer simulations they are monitoring the changing structure of the ice and investigating what effect this may have. One of the effects of the increased temperatures is that there are now large pools of meltwater forming on the ice shelf during summer – with investigations ongoing as to their long term effects. Project MIDAS first suggested that Larsen C had begun to break up in August 2016 and have been monitoring the progress of the growing rift since then. They have now reported that the rift, or crack, in the shelf has grown an astonishing 11 miles (17 km) from May 25 to May 31 2017. Now, the rift is within 8 miles (11 km) of breaking all the way through to the ocean. When the ice shelf does break off, it will produce one of the biggest ever recorded icebergs. It is expected that this will happen imminently, a fact that the researchers are fairly confident of, because the tip of the rift has turned towards the ocean, which usually suggests that it is very close to fracturing away from the main shelf of ice. When this section of the shelf breaks off – known as calving – between nine and twelve percent of the Larsen Ice Shelf will collapse. To put this into perspective, this is an area roughly 2,300 square miles (6,000 km2) in size. That’s larger than the US state of Delaware, a quarter of the size of Wales or the same size and Trinidad and Tobago. This will leave the Antarctic ice front at its smallest size ever recorded. Scientists at the MIDAS Project suggest that the fracturing of the ice shelf will fundamentally change the landscape of the entire Antarctic Peninsula. Because the ice shelf will be breaking off from floating ice, it won’t lead to an increase in sea levels just yet, but it could well be an indication that the entire Larsen Ice Shelf will also break up, which will most certainly lead to an increase in sea levels. Scientists use ice shelves as an early indicator of environmental changes, with the disintegration of Antarctic ice shelves moving steadily towards the South Pole corresponding to the fact that the Earth’s temperature is rising. Location map of LCIS showing the sites of the OPTV borehole logs reported herein overlain on 2009 MODIS “MOA” image. Whilst it is of course difficult to say whether or not this occurrence has something to do with global warming or not, what we can be sure of is that when Larsen C does break off, it will be a particularly spectacular event that will give us more clues as to the effect of our warming climate on this icy corner of planet Earth.